This article submitted by Erin Aagesen on 6/21/00. Eight students recently tested their language skills while sight-seeing in Costa Rica for seven days. Members of the groupÐall from the Spanish III class at PAHSÐ were in the Central American nation from June 5 until June 12. They toured as a group during the day, and stayed with a host family at night. 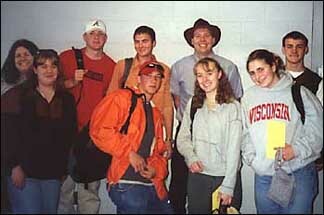 Spanish teacher David Wilke chaperoned the students in the first ever PAHS Spanish trip. Krista Bengtson, Mark Brossard, Amanda Reeck, and Megan Nyffeler, (front L to R) and Amie Stockholm, J.T. Koehn, Corey Schmitt, instructor David Wilke, and Scott Ingalsbe (back row) were the participants. The group departed from Minneapolis on Monday morning, June 5, and began a flight that lasted longer than expected. They flew into Houston, and following a three-hour layover, continued their journey towards Costa Rica. Due to fog, however, they were unable to land, so they flew an extra hour to Panama City where conditions were better. They landed and waited in the airplane at the Panama City airport for two hours until the fog subsided. They were forced to stay inside the plane in order to avoid having to go through customs in Panama. When the fog cleared, they landed safely in Costa Rica. By then it was midnight. The Costa Rican host families picked the tired travelers up at the airport. Two students had been assigned to each family. All the families for the Paynesville group lived within a mile radius in Guadalupe, a suburb of the capital city, San Jose. On Tuesday morning, breakfast was taken with the families. According to Wilke, traditional breakfasts consisted of different types of fruit, bread and juice, or even a bean and chicken dish. "The primary job of the family was to feed us breakfast and dinner and provide us with an overnight stay," said Wilke, adding that the family experience was beneficial. "My family was very hospitable and I got to speak a lot of Spanish," he added. The main goal of the trip was to allow the students to practice speaking the Spanish language through conversations with native speakers. "At first the kids were really frustrated because their families were speaking very fast," said Wilke. "By the end of the week they had good conversations and became more confident in their language skills." "Every night we had a conversation in Spanish," said Reeck, who stayed with the same family as Nyffeler. "It would have helped to know more Spanish, but it was interesting trying to use the Spanish that I did know." Some families, like the one Reeck and Nyffeler stayed with, had family members who could, if necessary, speak excellent English. For others, speaking English was not an option. Schmitt, who stayed with Ingalsbe, said, "Our family didn't know any English, but it went better than I expected. They treated us like we were their family." Wilke was proud of how his students got along. "You get what you put into it," he said. "The kids put in the effort to speak with their families, so they got a lot out of it." Amanda Reeck noted another difference. "With their economy, they have much less than we do, but they were very happy with what they did have." The Paynesville groupÐ along with groups from Missouri, Illinois, and KansasÐ met every morning at a church in Guadalupe to begin their touring. Most of the traveling was done by bus with a tour guide who spoke both English and Spanish. On that first day, the students toured the city of San Jose. They saw the National Theater, the National Museum, and ate fast food in a mall much like those found in America. Wednesday was spent visiting a volcano in a national park outside of San Jose. According to Wilke, 35 percent of Costa Rica is made up of protected national parks. The group hiked up the volcano, which is considered active, though it only vents steam. They got to see a tropical rain forest in the lower lands, and, as they moved up the volcano, the thicker, lower-growing cloudy rain forest. "The scenery is just magnificent," said Wilke. "There are thousands of different types of trees and vegetation." 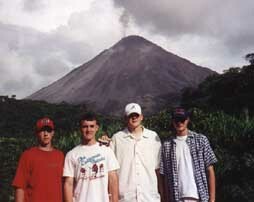 Pictured with the volcano in the back are: Mark Brossard, Scott Ingalsbe, J.T. Koehn, and Corey Schmitt. "I thought it was incredibly beautiful. All of the mountains were covered in trees," said Nyffeler. Later, they visited a village known for making ox carts and wood products. They observed the factory process and learned about what goes on in the village. On Thursday, the travelers visited a very active volcano northwest of San Jose. On the way there, they saw birds, bats, sloths, and Jesus Christ lizards, which move so fast they can walk across the surface of water. A large portion of the day was spent at a spa at the base of the volcano, wading in hot springs and watching the eruption of the volcano. During the day it was difficult to see how much the lava was moving because it appeared to be gray, Wilke said. Once the sun went down, though, the lava took on a reddish glow that was visible moving down the volcano. "My favorite part of the trip was the day at the volcano and the hot springs," said Reeck. Friday was a day to visit a coffee plantation and a butterfly farm. On the plantation, they learned about the history of coffee and the method for processing coffee beans. At the butterfly farm, they were given information on butterflies and told about how the butterflies were raised for commercial and preservation purposes. Costa Rica holds five percent of the world's butterfly population and sells the butterflies it raises across the globe. Saturday was a relaxing day at the beach on Tortuga Island, located a short boat ride off the Pacific Coast of Costa Rica. The group played volleyball, swam, and rode kayaks and paddle boats. The vegetation at this location was rich. "It was kind of like a little paradise," said Schmitt. The final day of the tour was Sunday. The students were able to ride a gondola, which is like a ski-lift, up from the base of the rain forest to the top of the canopy. The guide taught them about rain forests, and many students spotted animals. The students saw a poisonous viper snake, large spiders, and a raccoon-like animal. Finally, they took a boat ride down the Sarapiqui River along the Atlantic side of the country. Part of the scenery were caymen, iguanas, and howler monkeys. The return flight began Monday morning, and the students arrived home late that night. "I really didn't want to leave," said Nyffeler. "I plan to go back sometime, but I don't know when." "The Paynesville kids set a very good example for other students," said Wilke, "I was very proud to have them on the trip. There are some real good kids here." Wilke is currently planning another trip for his Spanish students in two years. The next group will be traveling to Spain.